Maschine 1.6: now an even more complete groove production studio. Native Instruments Maschine has just got a whole lot more flexible thanks to a free update (version 1.6 ) that adds VST and AU instrument/effect hosting. You've been able to use the Maschine software as a plug-in from day one, but the addition of hosting is great news for anyone who wants to run it standalone. What's more, plug-in parameters are automatically mapped to the knobs on the Maschine hardware controller. Read on for the official press release announcing the update, which also includes several other new features. Also be sure to check out the above video which features Underworld's Darren Price showing you how he uses Maschine live, and the one below that has hip-hop producer Ski-Beatz using it in the studio. 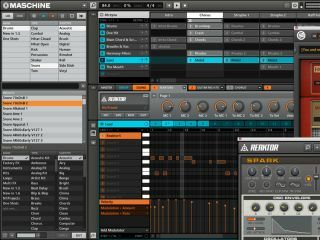 Native Instruments today released MASCHINE 1.6, a major free update for its acclaimed groove production studio. With the addition of plug-in hosting for instruments and effects, the new version significantly expands the scope and functionality of the system. MASCHINE 1.6 also includes a free download of the new KOMPLETE ELEMENTS bundle, and adds a multitude of other new features for studio production and live performance. With added support for VST and AU plug-ins, MASCHINE 1.6 profoundly widens its creative possibilities, turning the system into a full-featured instrument host. Both the whole range of KOMPLETE INSTRUMENTS as well as all third-party instruments and effects can now be used directly in MASCHINE, complementing its integrated sampler and FX features. Due to an "Auto-Mapping" function, plug-in parameters are conveniently pre-assigned to the high-resolution knobs on the MASCHINE controller, allowing for intuitive sound tweaking directly from the hardware. To give producers an even more comprehensive sound arsenal on top of the sample-based factory library of MASCHINE, the 1.6 update also includes a free download of the new KOMPLETE ELEMENTS instruments and effects collection. Based on the powerful engines of KONTAKT, REAKTOR and GUITAR RIG, it contains over 1,000 production-ready sounds selected from the studio-standard KOMPLETE 7 bundle, including Abbey Road vintage drums, Vienna Symphonic Library orchestral sounds, an assortment of sampled band instruments, various REAKTOR-based synthesizers, a versatile assortment of amp emulations and effect pedals from GUITAR RIG and more. Further enhancements in MASCHINE 1.6 include an increased number of effect slots, a new "Pad Link" feature, individual swing per sound, clip and sample renaming, expanded Drag & Drop functionality, support for up to 32 audio I/O channels, full Mac OS X 64bit support, and a wide range of detail optimizations. The 1.6 update and the KOMPLETE ELEMENTS bundle are available as free download for all owners of MASCHINE.